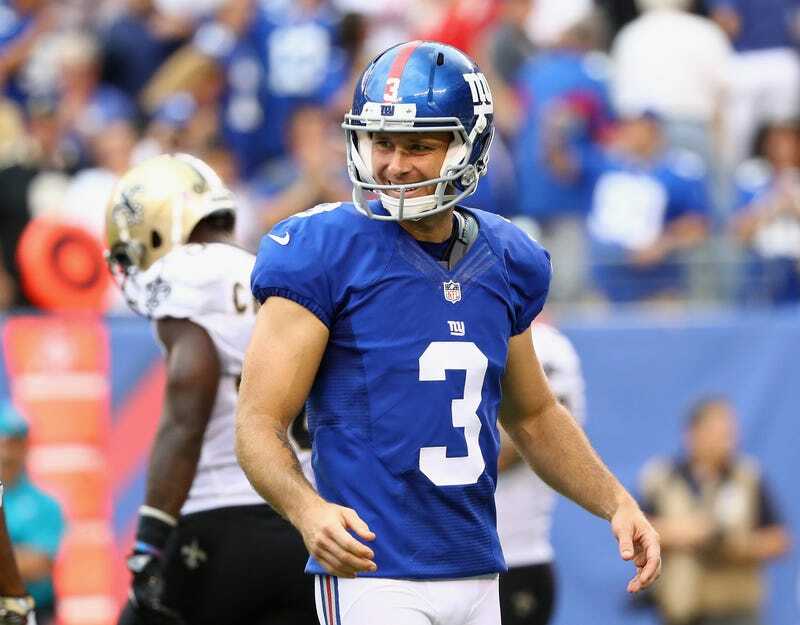 New York Giants kicker Josh Brown is a woman-beater. Full stop. He's not paid to beat women. He's paid to kick a football. The former has not affected the latter. The New York Giants still employ Brown even though they know Brown is a woman-beater. It isn't a secret because Brown admitted to being an abuser after a 2015 arrest. Brown's former wife, Molly, the subject of Brown's aggression, turned over 165 pages of documents to the King County (Wash.) Sheriff's Office after Brown's arrest. Those documents were recently sent to several news outlets and include journal entries by Brown admitting to abusing his former wife. "I became an abuser and hurt Molly physically, emotionally and verbally," Brown wrote, the New York Times reports. "I viewed myself as God basically and she was my slave. I carried an overwhelming sense of entitlement because I put money higher than God and I used it as a power tool." The documents also indicate that Brown violated a restraining order and detail three 911 calls Molly Brown made during their relationship. Brown's former wife also says that she was abused at least 20 times during their marriage. After Brown's May 2015 arrest involving the incident with his wife, the NFL conducted a 10-month investigation. The league now says it didn't have those documents when it concluded its investigation. The NFL's verdict on Brown's incident: a one-game suspension. One. Game. This isn’t just about the brotherhood of the NFL, which might only be comparable to the blue wall of silence; this also is about the racial dynamics of what constitutes news and suspension in the league. This is about how punishments are doled out and who's being hurt. While the focus these days seems to be on the dozen or so players who have knelt, locked arms or raised a fist during the national anthem in protest of the police violence against unarmed men, women and children, the NFL has habitually allowed violent offenders to remain in its league—and tolerated and assisted them in doing so. Make no mistake about it; the NFL doesn't care about women. Don't let anything it does try to tell you differently. Despite all the pink, NFL-issued, breast-cancer-awareness garb and the great public relations push it made to show off the first female NFL referee—in 2015!—or the bulls—t public service announcement it created around domestic violence, it’s clear the NFL has never, ever cared about women and that some of the men it employs abuse them. The Giants knew that Brown was an abuser, and Giants co-owner John Mara admitted such during an interview Thursday on WFAN in New York after the documents were released. Mara noted how, during the Pro Bowl in Hawaii in January, Brown's children and his then-wife, Molly, had to be moved by NFL security when a drunken Brown showed up and began pounding on her door. "He admitted to us that he’s abused his wife in the past. I think what’s a little unclear is the extent of that," Mara said. No, sir. I think what's a little "unclear" is why the talk out of New York this week has been about Odell Beckham Jr.'s celebration taking the focus off the team, and not that inside the locker room is an admitted abuser who once believed himself to be God and his wife a slave. Didn't have all the documents? Doesn't matter. The documents merely confirmed what Giants owners already knew: that Brown was and has been a woman-beater. Mara even added: "We’re obviously disturbed by some of the things we read. There’s no excuse ever for any type of domestic violence." Except there is, since you all knew that Brown was a confessed abuser and did nothing to stop it. I'm curious as to what the acceptable level of domestic abuse is in the NFL. Since the Giants owner knew that Brown was a woman-beater but just didn't know to what extent, I'm unclear as to what is the NFL's level of acceptable abuse, because the post keeps moving. Seems like anything short of a videotaped assault is fair game. Defensive end Greg Hardy reportedly beat and threatened to kill his then girlfriend and continued playing in the NFL until the Dallas Cowboys figured out that he probably has some screws loose. Wide receiver Brandon Marshall has been arrested and charged four times in domestic incidents including a charge of misdemeanor battery against a girlfriend, yet he's still catching passes for the New York Jets. Linebacker Daryl Washington pleaded guilty to assaulting an ex-girlfriend in 2013, and he's still playing with the Arizona Cardinals. So, now that the news has broken, the NFL and the Giants have to take this on. The Giants announced that they would be leaving Brown in the U.S. while they travel to London to face the Los Angeles Rams. The Giants issued some ho-hum statement about how they were going to look into the new developments, but they probably won't do anything, and the league won't, either. But let's keep the focus on Colin Kaepernick's silent protest during an anthem that was never written with us in mind. Let's keep acting as if the NFL doesn't have a domestic-abuse problem. Let's keep silent about what the NFL really doesn't want to discuss.